Napanee's Evan Foley (right) battles for a flying puck in front of Lakefield's net during Sunday's pre-season match. Photo by Adam Prudhomme. For all the buzz around the Napanee Raiders’ offensive potential heading into the regular season, on Sunday night they proved they can be just as overpowering in their own zone. 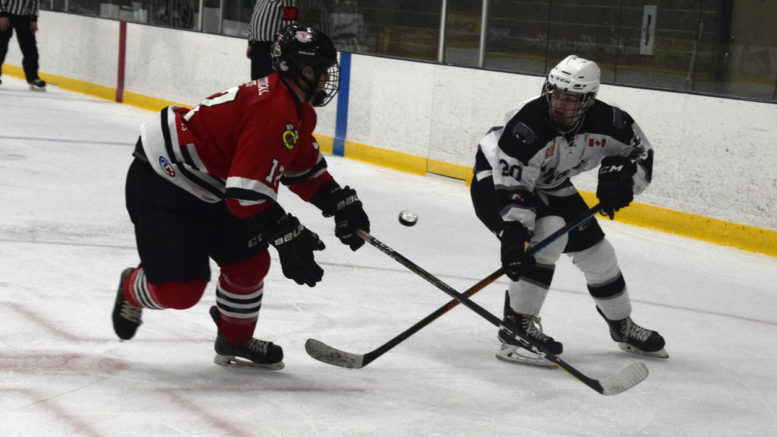 They closed out the exhibition season with a 3-1 win over the visiting Lakefield Chiefs, giving them a home-and-home sweep in the pre-season series. During that stretch they held the defending Schmalz Cup champions to just four goals total. On Sunday it was once again the Port Hope connection that got the scoring started in the first as offseason acquisitions Cameron Harris and Evan Foley each potted a goal over a stretch of two minutes and six seconds. Matt Stevens and Sebastian Killcommons assisted on Harris’ power-play goal while the third Panther acquired in the offseason deal, Dayton Kent, assisted Foley. Napanee’s blue-line took it from there, while offseason goalie signing Bailey Maracle was perfect over his period and a half of action in net. Nicholas Nabuurs took over from there and was just as strong, allowing just an early third period goal to Lakefield’s Evan Marlowe. Devon King offset that goal at the 13:48 mark, with help from Foley and Matthew Panetta. All told the Raiders outshot the Chiefs 37-22 on the night. Jeff Foster returns to the Raiders’ bench while Jim Elder and Mat Goody have joined on as assistant coaches.Caitlin McCuaig joins the training staff that includes returnees Kai Degen and Roddy Todd. While the Raiders may look strong on paper, Hartwick says there’s a lot more to like about the team than the stats on the back of their hockey cards. Though the Foley-Harris-Kent deal brought in three of the league’s top scorers to an already league best offense, Hartwick says the team made a conscious effort to improve all aspects of their game. In net Nabuurs returns after going 21-2 with a sparkling 1.58 GAA for the Raiders. Maracle, a 17-year-old native of Deseronto, saw some time with the Picton Pirates last year as well as the Quinte Red Devils. After their perfect 2-0 pre-season, the games will now start to count on Friday when the Picton Pirates come to town for a 7:30 p.m. puck drop. On Saturday they travel to Port Hope for a 7:30 p.m. showdown. Hartwick says the team is also looking forward to the new cross-over element to this year’s schedule, when they face teams in the Orr Division.